A brilliant conservator once noted that “art conservation is a fight against entropy.” This is especially visible for works sited outside which require conservators, artists, and stakeholders to carefully consider what is essential for an outdoor sculpture to continue to exist for future generations. 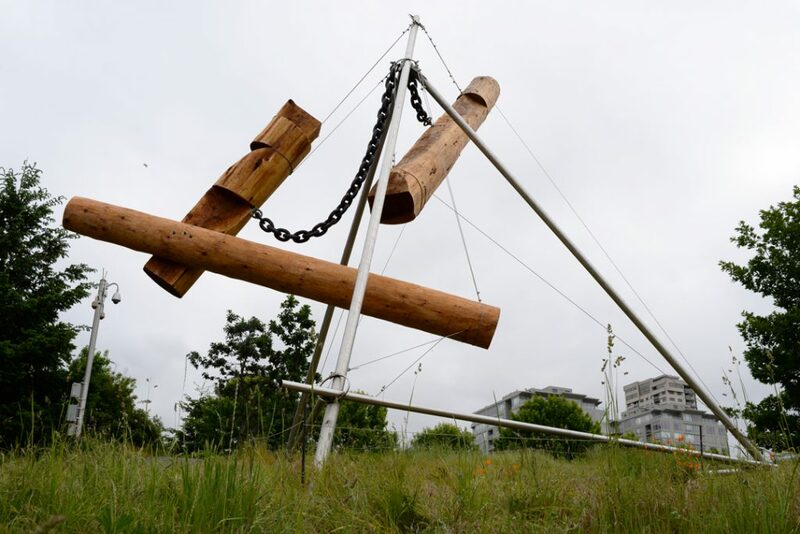 When the carved cedar elements of Mark di Suvero’s sculpture Bunyon’s Chess were no longer structurally stable, di Suvero and his studio worked closely with the Seattle Art Museum to explore the artwork and discover solutions. Bunyon’s Chess was created by Mark di Suvero in 1965 for Virginia and Bagley Wright’s residence in Seattle. 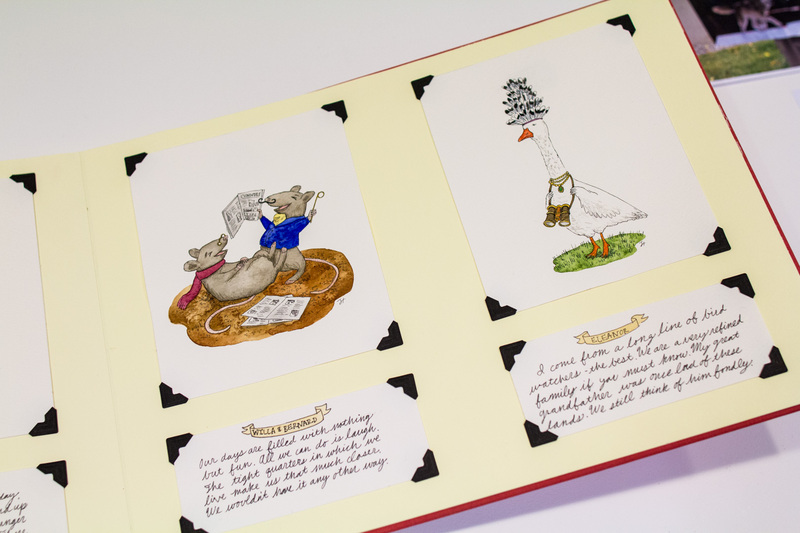 The family’s documentation of the creative process provides wonderful insight into the artwork. 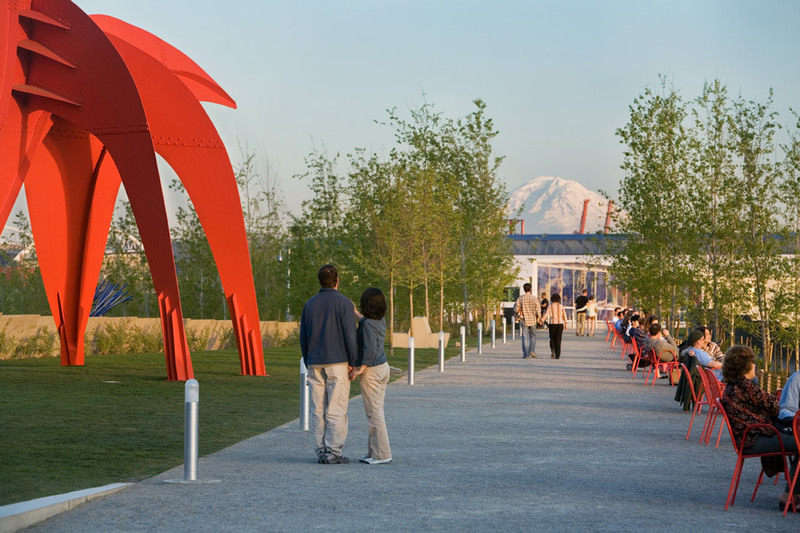 In 2006 the Wrights promised the work to the Seattle Art Museum and it was moved to the Olympic Sculpture Park. The cedar elements had begun to show degradation in their original site but this accelerated at the park partially due to the exposed location and partially due to the natural deterioration of cedar. As cedar ages in an outdoor setting a number of events occur: the natural biocide slowly migrates out with water, the wood absorbs water at an increasing rate as it deteriorates, fungal deterioration is common, as well as insect and wildlife damage. 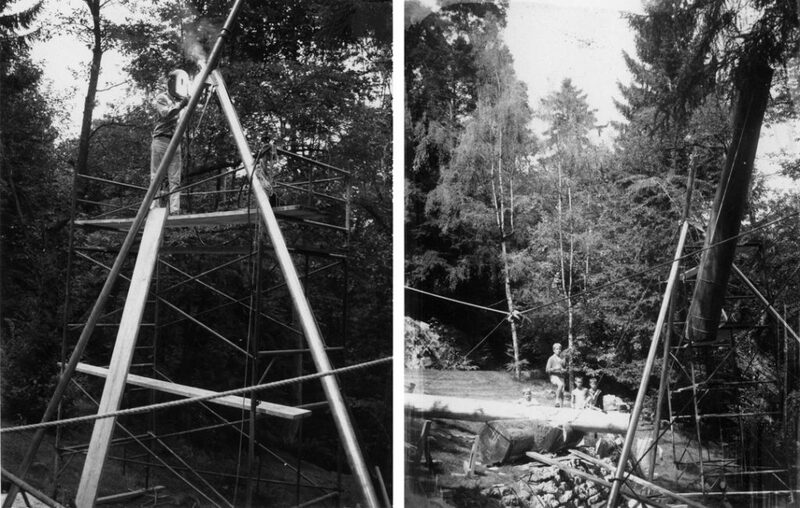 The logs of Bunyon’s Chess were treated annually with a fungicide to slow the fungal deterioration but without major visual interventions such as end caps or moving the sculpture to an interior location, deterioration continued at a fairly rapid pace. 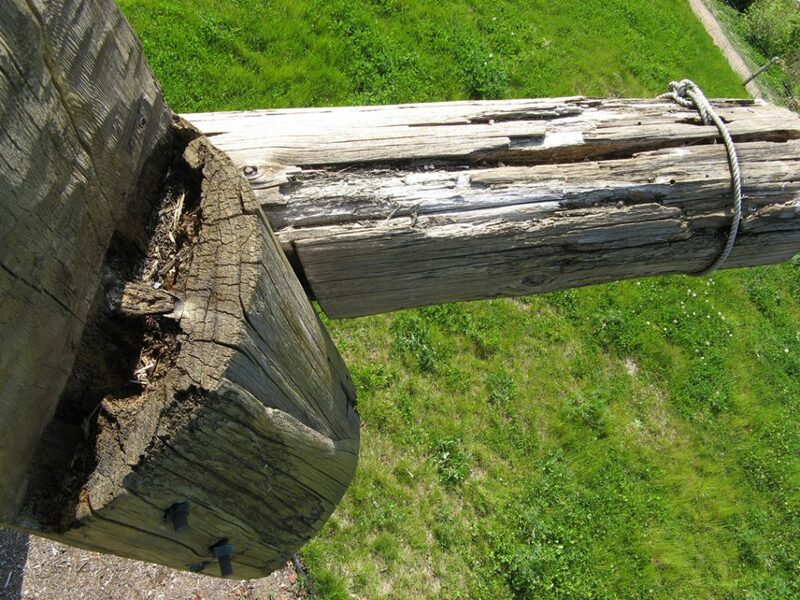 In 2009 an in-depth condition assessment was performed which determined that the deterioration, particularly on the interior had progressed to a state where the logs were in danger of falling. In 2010, the logs were consolidated, the large losses filled and the exterior coated to prolong the life. During this period research and conversations with di Suvero regarding the replacement were begun as this treatment could not prolong the life of the cedar indefinitely. Di Suvero determined that new logs could be carved to replace the original cedar, as it is the visual integrity of the work that is important. After much research, new cedar of the similar dimensions and tight ring growth was sourced for carving. Seattle artist Brian Beck peeled the logs in preparation for carving. 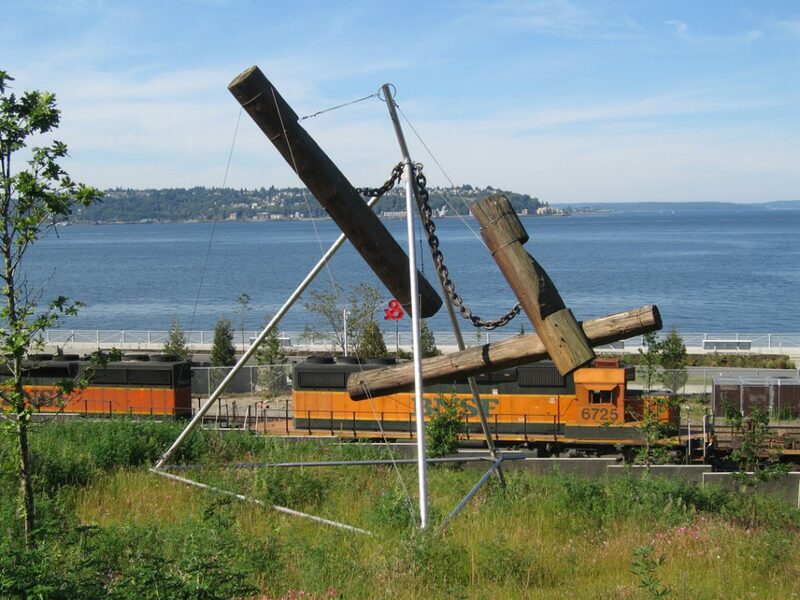 Kent Johnson and Daniel Roberts from di Suvero’s studio traveled to Seattle and carved the new logs using the original cedar elements as a guide. 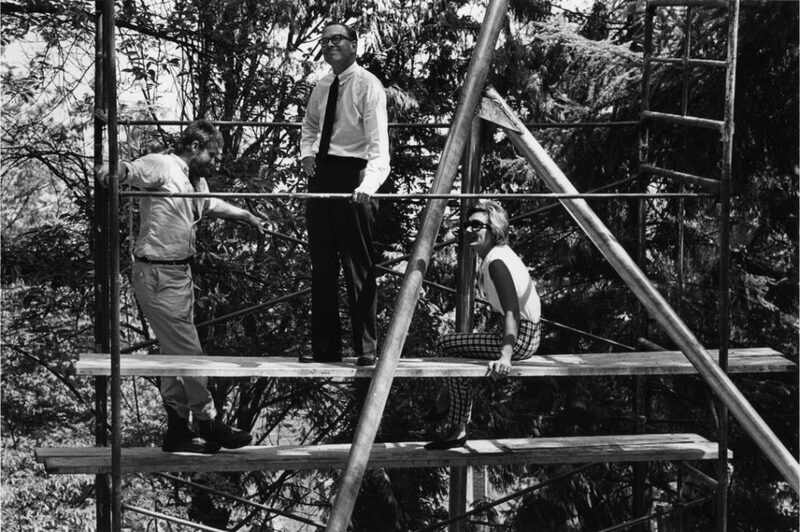 Beck worked with Johnson and Roberts to create the same join between the two logs. Much of the original hardware such as the 36” bronze bolts and galvanized steel eyehooks were presevered and reused on the newly carved elements. If you look carefully, at the top of the sculpture you will note a slight bend in the top tube. Di Suvero wanted this natural bend to remain but believed this opportunity should be used to reinforce the structure. Fabrication Specialties Ltd. worked with the di Suvero studio to create an interior support which was welded in place. 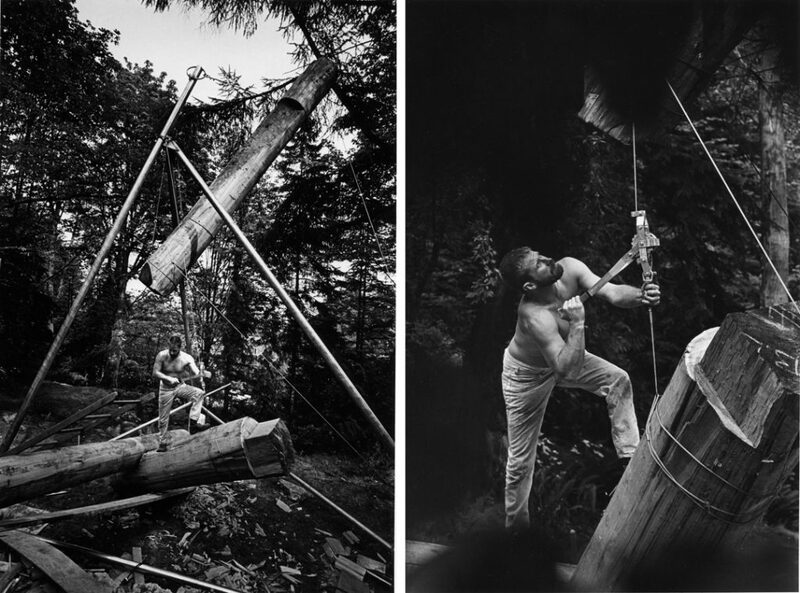 The logs were strung with new stainless steel cabling and were carefully measured and marked to the lengths of the original cables to assist with the rigging. Larry Tate, Andrew Malcolm, Tracy Taft, Ignacio Lopez, and Travis Leonard of Fabrication Specialties placed the new logs within the original steel frame working closely with images and a model of the original. The di Suvero studio generously participated in video calls throughout the day. Special thank you to: Mark di Suvero and Studio, Virginia Wright, Fabrication Specialties Ltd, Equinox Studios, Alta Forest Products, Brian Beck, Christian French, and Catharina Manchanda for helping preserve this public artwork free for everyone to enjoy at the Olympic Sculpture Park year round. Photos courtesy of Virginia Wright and Liz Brown. Walking through the Grove at the Olympic Sculpture Park, it’s easy to forget you’re in a city. As the path descends, the flickering Aspen leaves, purple pops of Oregon grapes, and thick layers of ferns make the urban landscape feel suddenly distant. One could almost mistake the path for a hike outside city limits were it not for the landmark that emerges at the end: Tony Smith’s sculpture Stinger, a square, geometric fortress made of slick, black steel. Northwest, via the innovative design by architects Weiss/Manfredi and Charles Anderson Landscape Architecture. 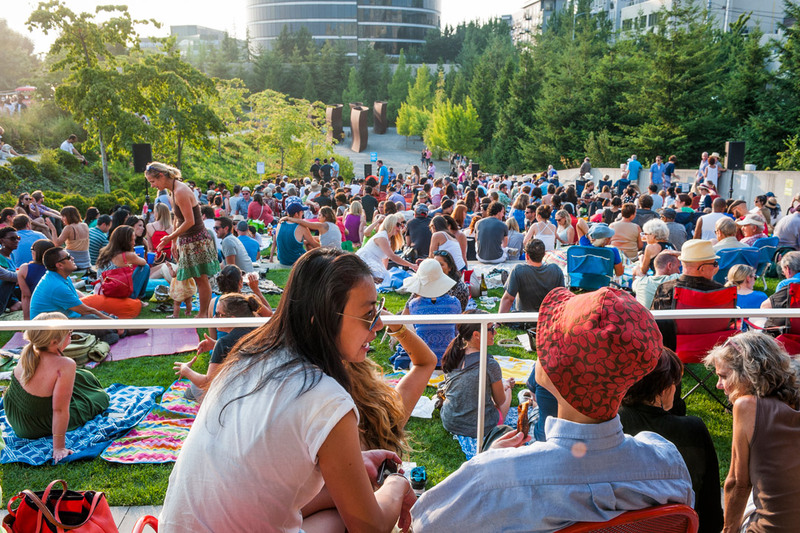 The Z-shaped Mosley and Benaroya paths guide visitors from the PACCAR Pavilion and surrounding cityscape at Elliott Avenue and Broad Street, down 40 feet to the waterfront below, bringing them through four landscapes that reference regional ecosystems along the way: the Valley, the Meadows, the Grove, and the Shore. 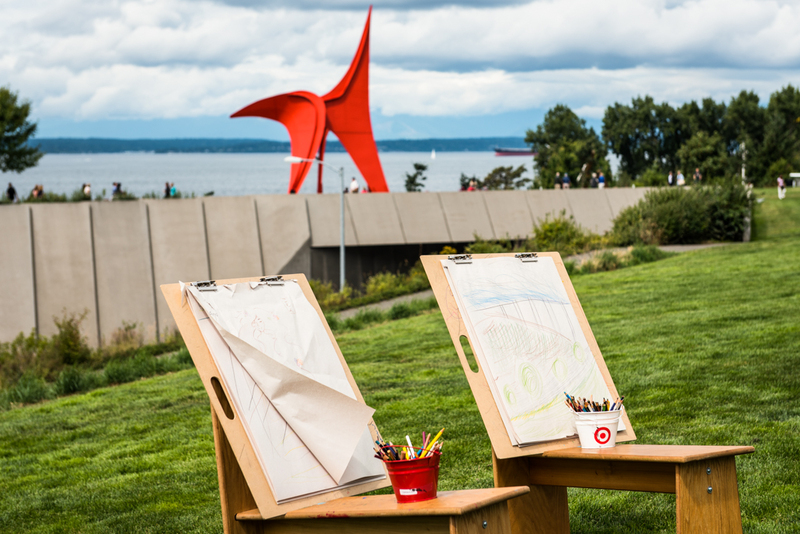 The Olympic Sculpture Park experience feels especially unique in the moments when the landscape, art, and design come together before our eyes. Whether this happens while sitting on one of Louise Bourgeois’s Eye Benches, spotting a seal on the Puget Sound, or watching crows perch in the steel branches of Roxy Paine’s Split, the land brings new insights to the way we see the art, and the art frames the natural world in ways we wouldn’t ordinarily see. Over time, the park’s sightlines will continue to shift and evolve, promising new encounters with every visit. Images: Photo: Natali Wiseman. Photo: Benjamin Benschneider. Photo: Paul Macapia. Photo: Paul Macapia. Photo: Paul Macapia. Photo: Paul Macapia. 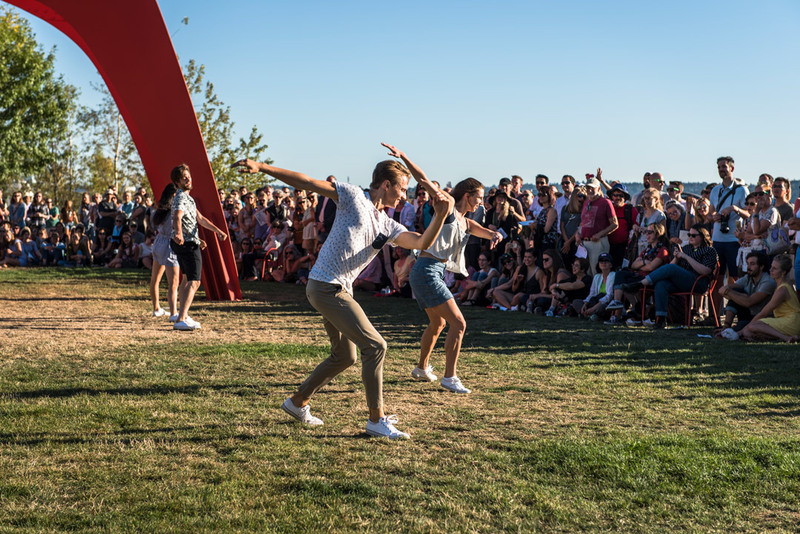 It’s the 10th anniversary of the Olympic Sculpture Park and Summer at SAM is bringing you entertainment and activities around art at the park, all summer long. 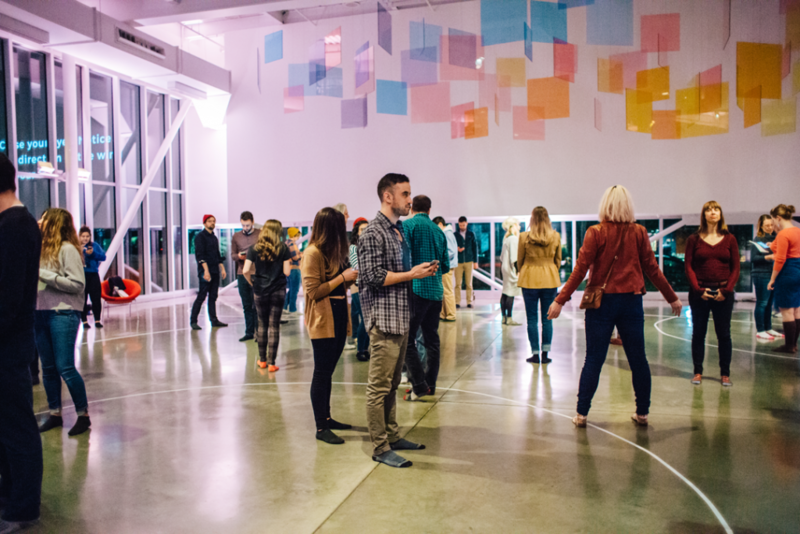 Mingle, make, and move until the sun goes down over the Puget Sound. 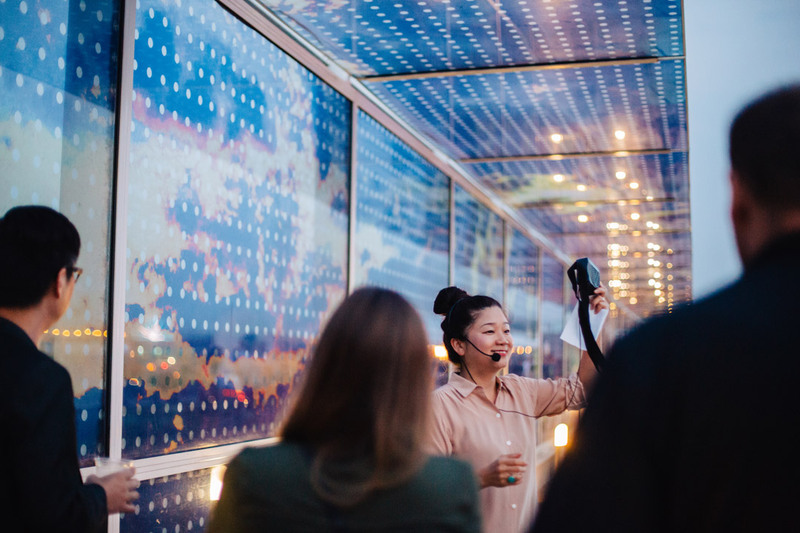 Inspired by SAM’s special exhibitions, Yayoi Kusama: Infinity Mirrors at the Seattle Art Museum and installations by Christopher Paul Jordan and Spencer Finch at the Olympic Sculpture Park, Summer at SAM explore place-making, cultural confluences, and learning from our local environment. 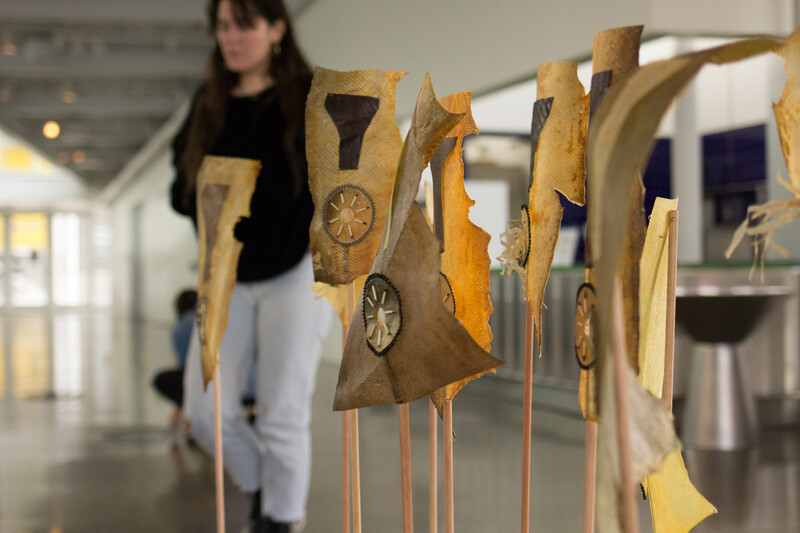 Like the sculpture park itself, all Summer at SAM programs are free, open to the public, and all-ages. 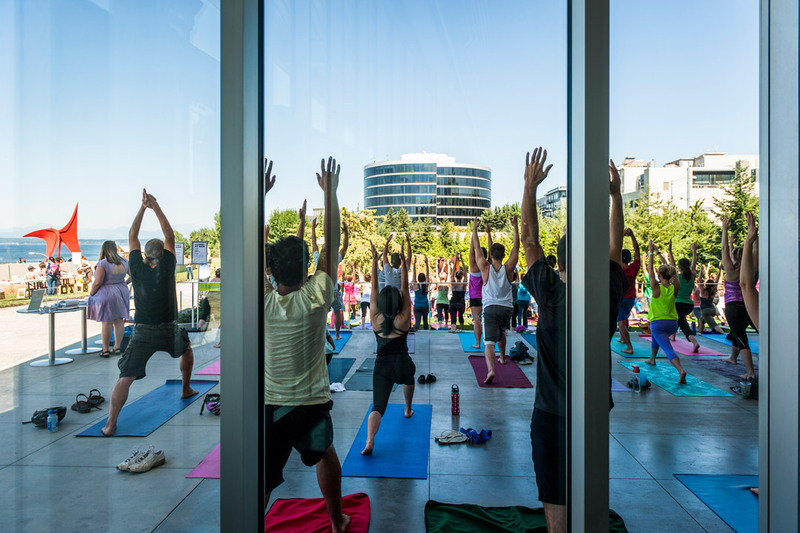 So check us out Thursdays and Saturdays, July 13 through August 31 and get active in your city with concerts, art making, food trucks, and fitness. 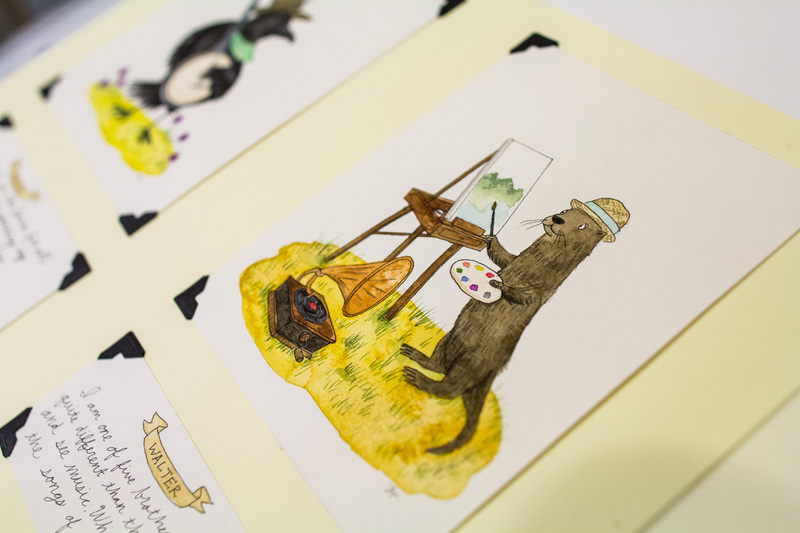 In their own words, get to know two of Summer at SAM’s partner organizations for events such as the Kickoff next Thursday, July 13 from 6–8 pm produced in partnership with Black & Tan Hall and our Saturday art activity led by artists of the Lion’s Main Art Collective. 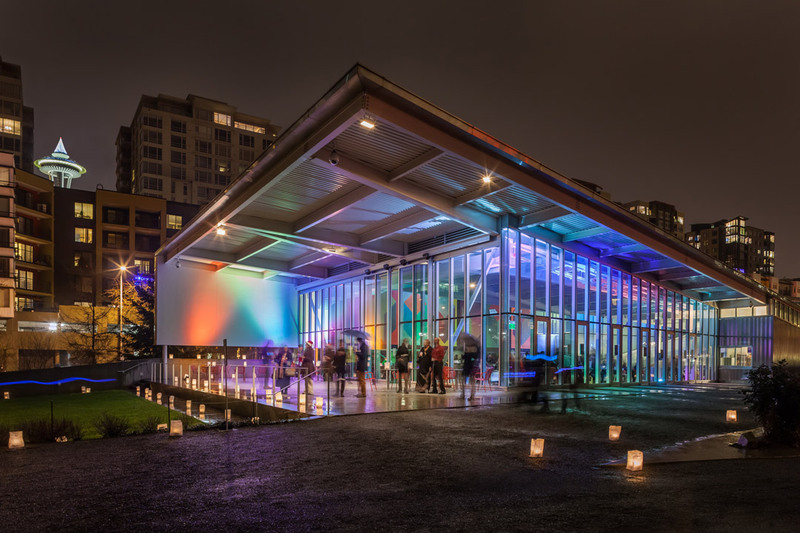 Black & Tan Hall, is the premier cultural event space that the south end has been waiting for. 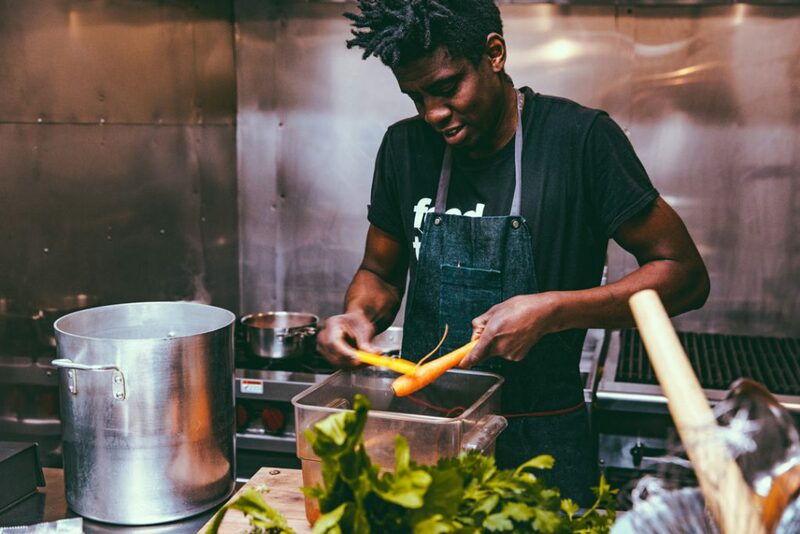 Its unique business model with over 20 community partners has given birth to a consensus-run establishment that prioritizes healthy, delicious food, fair pay to artists, and quality events. We want to give you a reason to dress up for a night on the town. Our upcoming partnership with SAM gives Seattle a small taste of what Black & Tan Hall will be producing when our doors open at the end of the summer. Chef Tarik Abdullah will be serving his eclectic North African inspired dishes made with fresh Northwestern ingredients on the lawn, while bands like New Triumph, Peace & Red Velvet, and the Mockingbirds light up the stage with hip-hop afro-caribbean beats, and DJ Toya B keeps the crowd lively throughout the evening. Black & Tan Hall will be open for breakfast during the week, brunch on the weekends, and dinner with select music, theatre, film, and dance events. We are also available for private rentals, and co-producing opportunities. We are “the people’s” establishment for diversity, community, creativity, and simply a good time! 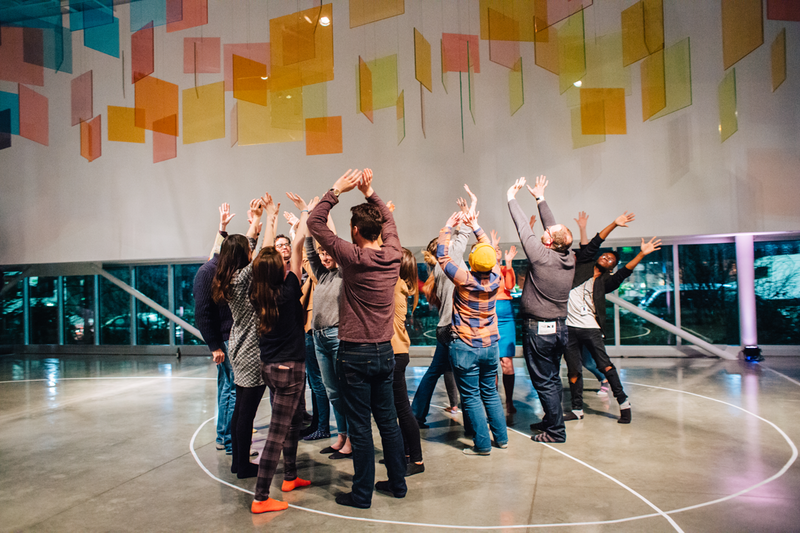 Lion’s Main Art Collective is a Seattle-based community of queer and trans artists that showcases innovative interdisciplinary art. 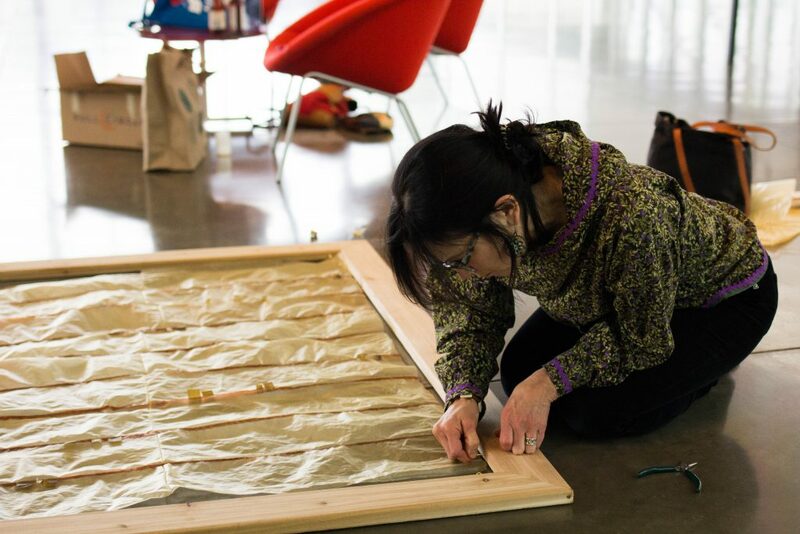 Participating artists are excited to present From the Foundation, an installation created from fabric and wood exploring private and public experiences of home. Combining screen printing, photography, painting, text, and zines, this project is takes a cumulative approach by gathering images and reflections from individuals in the LGBTQ+ community. Trinkets, pictures, recipes, and stories are screen printed on the walls entwining personal experiences into a communal web. Sofya Belinskaya, a Ukrainian-born visual artist, creates works on paper that oscillate between dreams and reality. She is compelled by the void, magical realism, and emotive narratives. She is a teaching artist and organizer based in Seattle. 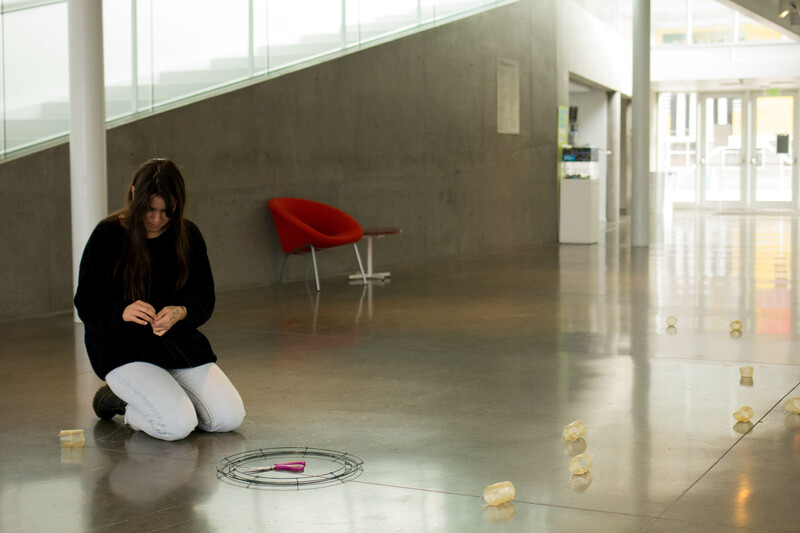 Jax Braun is a poet/writer, biologist, crafter, and performance artist. Their works are informed through the structure of biological worlds and dwell on interpreting personal histories and experiences. KEM_C is a Seattle-based printmaker/tapemaker/clubscum, specializing in etchings, screenprints, & VHS tapes. Ask her about a cozier alternative to safe/r spaces. Sequoia Day is a Seattle-raised queer arts organizer, photographer, painter, and full spectrum doula. They are drawn to the soft places that exist in people and home. Their work often touches on care, debris, and maintenance in the home space, and what spills forth from the places we build and inhabit. Emma Kates-Shaw is a fiber/found object/tattoo/paint/pen/pencil worker, fascinated by light, time, space, and the beauty of the early early morning. Markel Uriu is an interdisciplinary artist in Seattle. 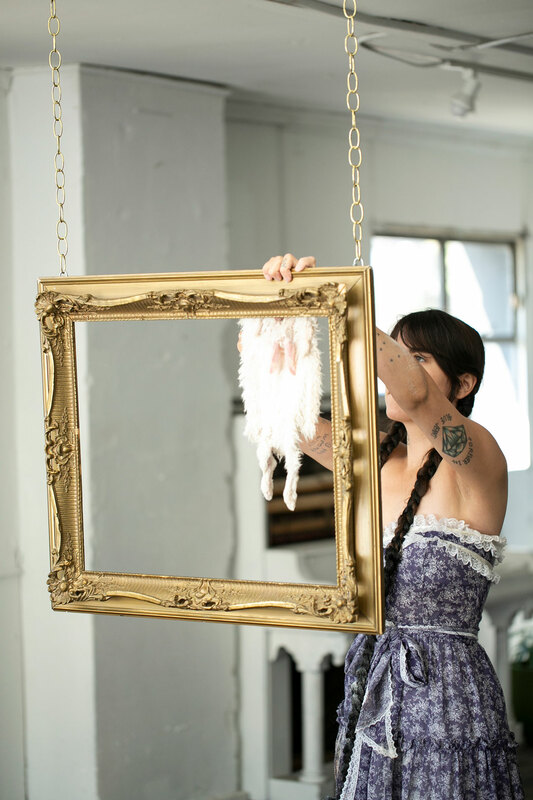 Her work explores the quiet intimacy of inner worlds, feminine labor, impermanence, and the unseen. Drawing from mythology and rituals, she explores these concepts through ephemeral botanical narratives and two-dimensional work. 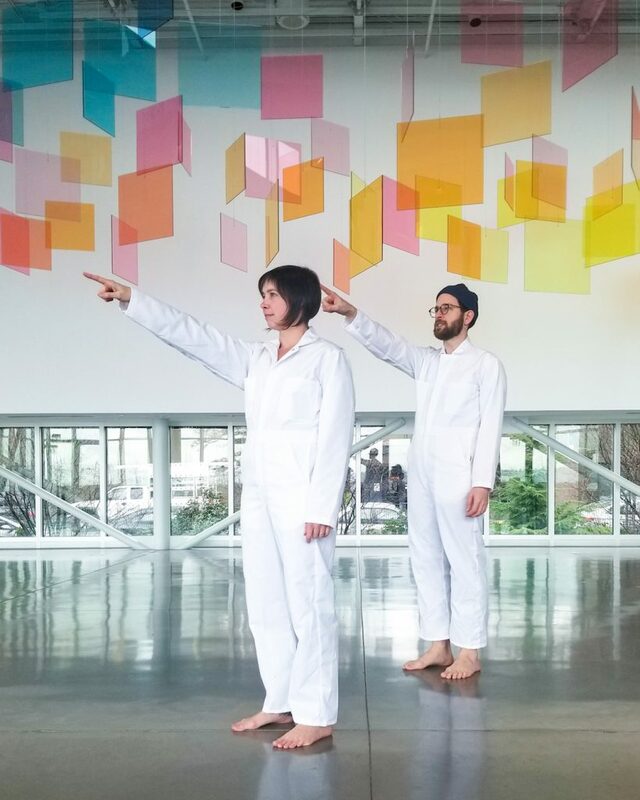 Established in 2013, Lion’s Main Art Collective is a non-profit organization curating multidisciplinary events and festivals, including Transience at King Street Station (2016), QTONE Shorts in collaboration with TWIST: Seattle Queer Film Festival (2016), and Othello Quartz Festival at John C. Little Park (2016). They have received funding from the Office of Arts & Culture and the Pride Foundation. Past partnerships include Henry Art Gallery, Gender Justice League, Gay City, and Three Dollar Bill Cinema. Photo: Robert Wade. Photo: Tarik Abdullah. 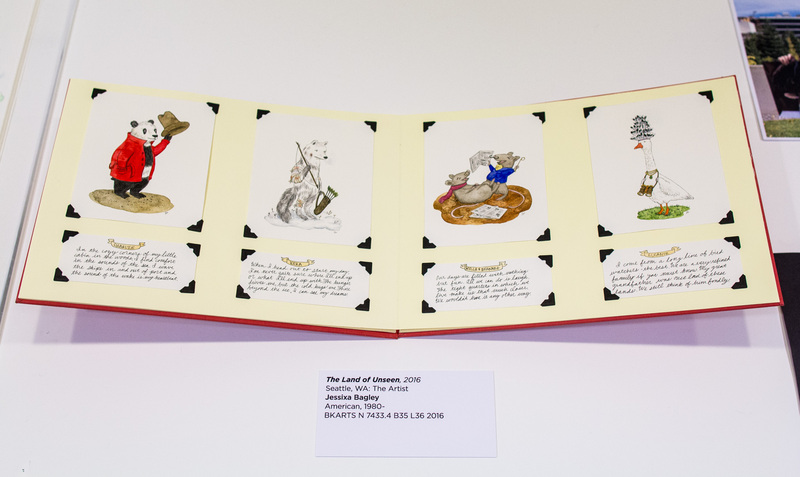 The Dorothy Stimson Bullitt Library‘s latest book installation, to coincide with the exhibition, Seeing Nature: Landscape Masterworks from the Paul G. Allen Family Collection, introduces a work that recently came into the library’s artists’ books collection. 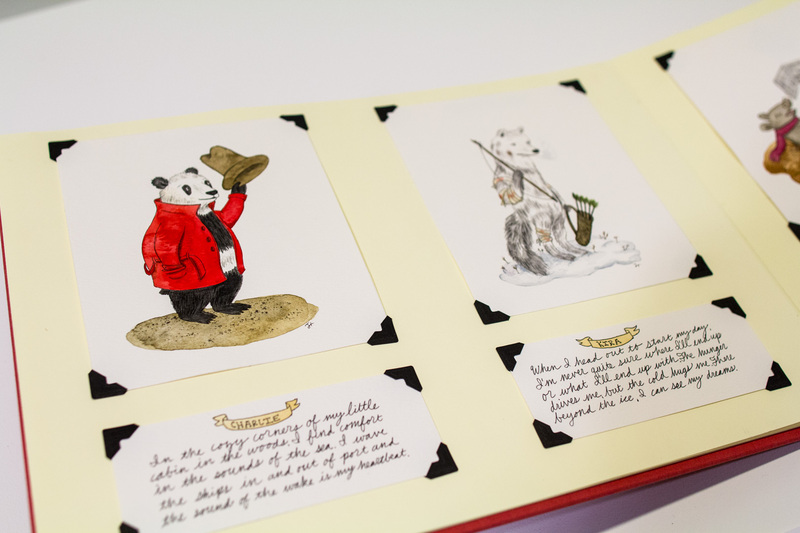 This illustrated book, with original pen-and-ink drawings and watercolors, was created by Seattle author, illustrator, zine creator, and book artist Jessixa Bagley. Bagley is best known for her award-winning children’s picture books: Boats for Papa (2015) and Before I Leave (2016). Her latest book, Laundry Day, was just published by Roaring Book Press in February 2017. 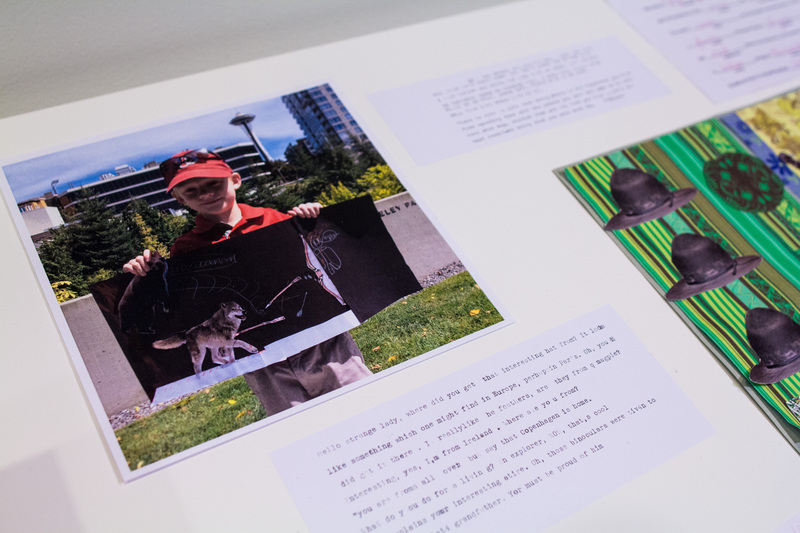 The work is the first in our collection to be born out of a Seattle Art Museum program. 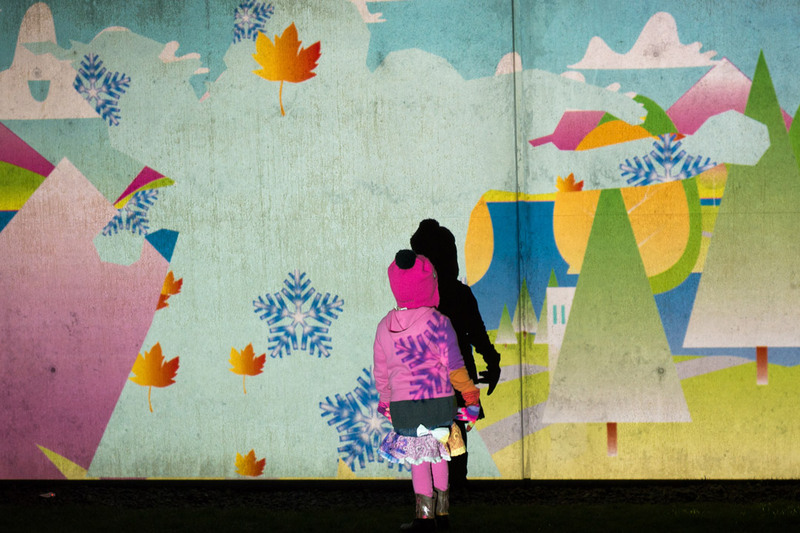 The Land of Unseen is a culminating storybook inspired by a collaborative process with visitors to SAM’s Olympic Sculpture Park. The “Summer at SAM” program was entitled “Build a World with Jessixa Bagley” and took place over several weekends in August 2016. 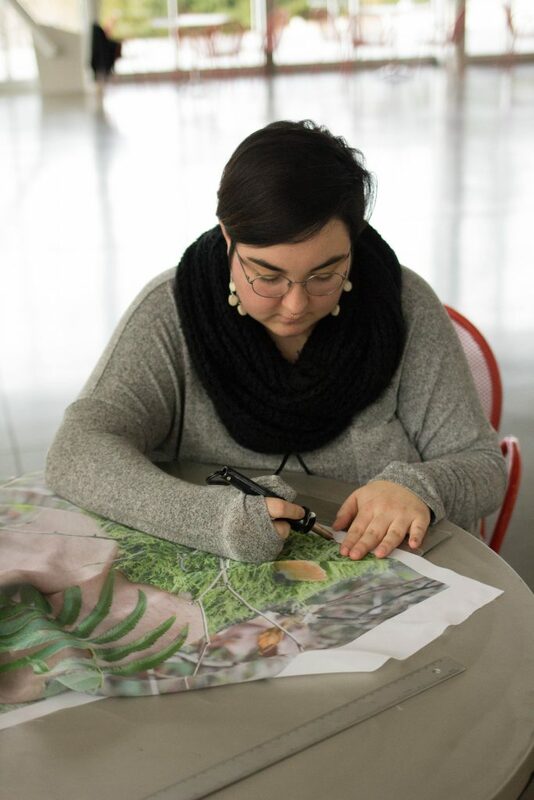 Jessixa invited participants to help her “create the unseen imaginative world of the Olympic Sculpture Park and give voice to all the creatures and animals that live within it.” Each week, visitors participated in interactive, open studio sessions that explored a different aspect of Bagley’s creative process. 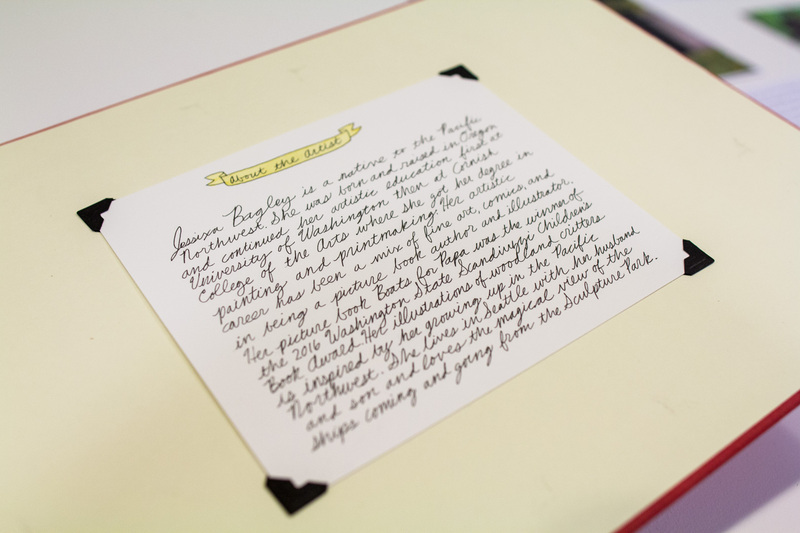 These sessions included plot development on vintage typewriters supplied by Carriage Return, character advancement through collage, and landscape mapping with watercolor and mixed media. 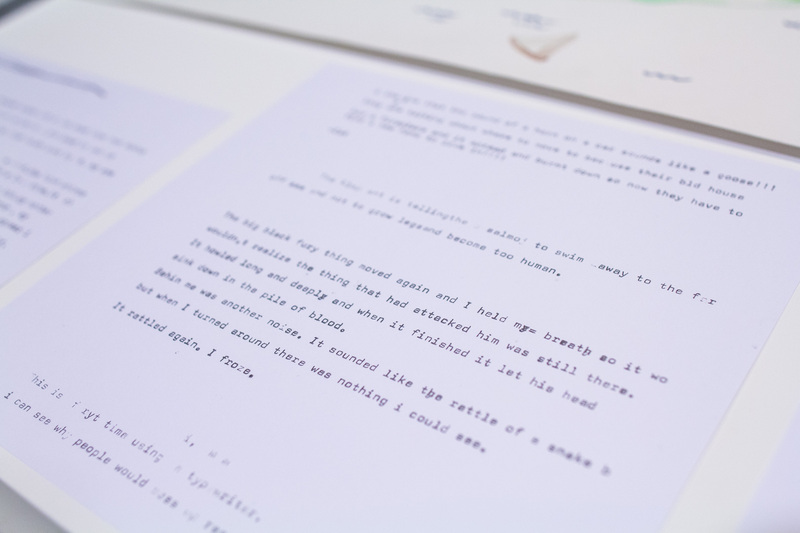 To construct this unseen land, the first group of park visitors were given prompts and encouraged to use typewriters to create stories about characters that live in the Olympic Sculpture Park. 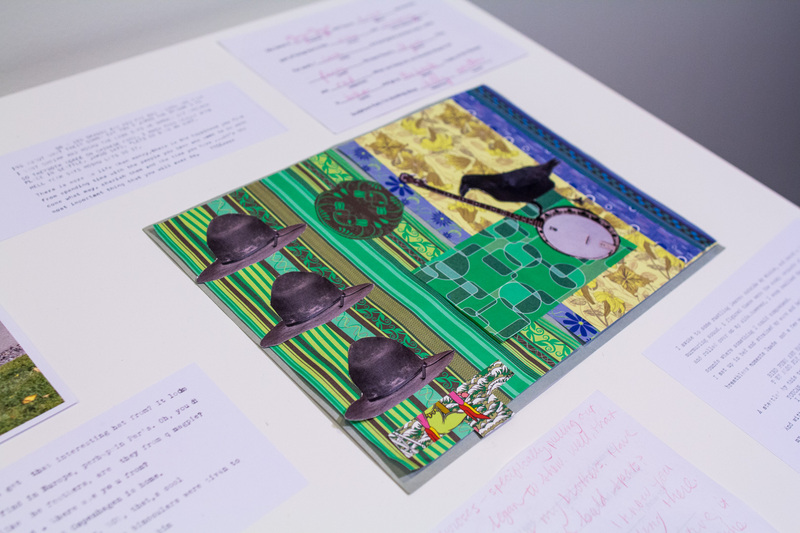 Next, Bagley had a different group of visitors develop those characters by creating collages based on the writings of the first group or from free-form ideas. 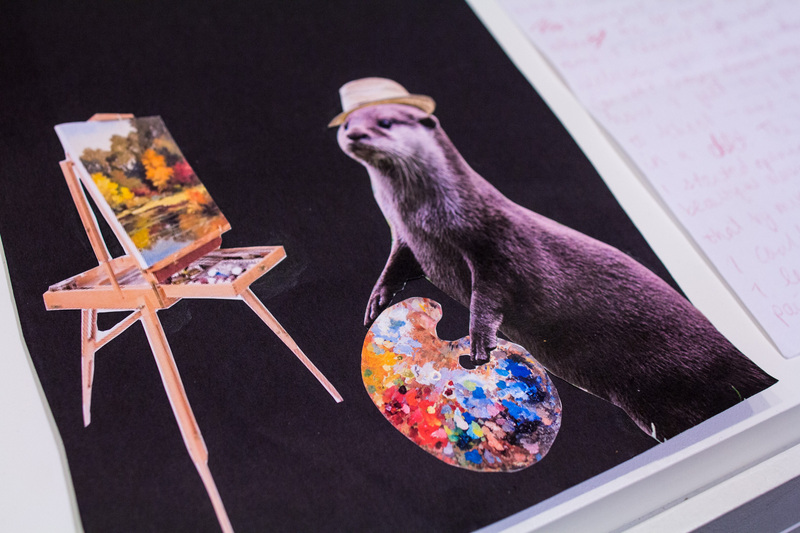 One participant imagined an otter wearing a hat participating in plein-air painting, creating a colorful landscape. Another imagined a crow strumming a banjo surrounded by hats reminiscent of National Park Service ranger hats, in a background of rich organic textures of yellow, green, and blue. 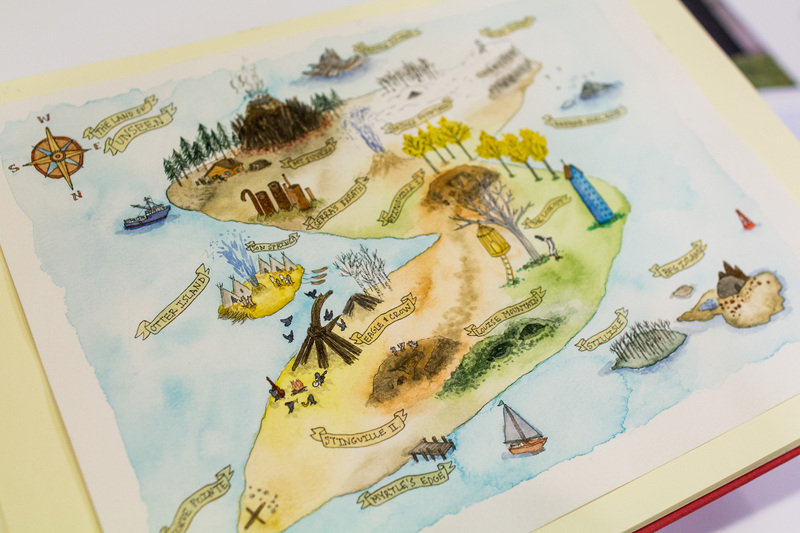 The final group of visitors was asked to create Mad Libs–style stories based on the collages, and ultimately a map of this hidden world began to take shape. 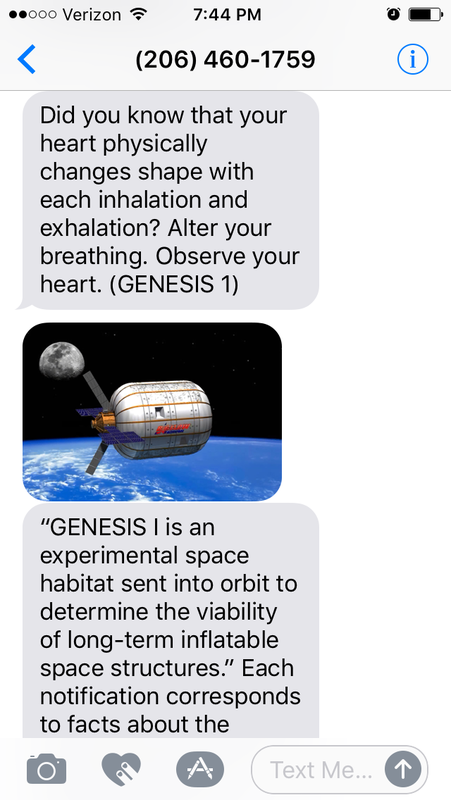 From there, the book was born. 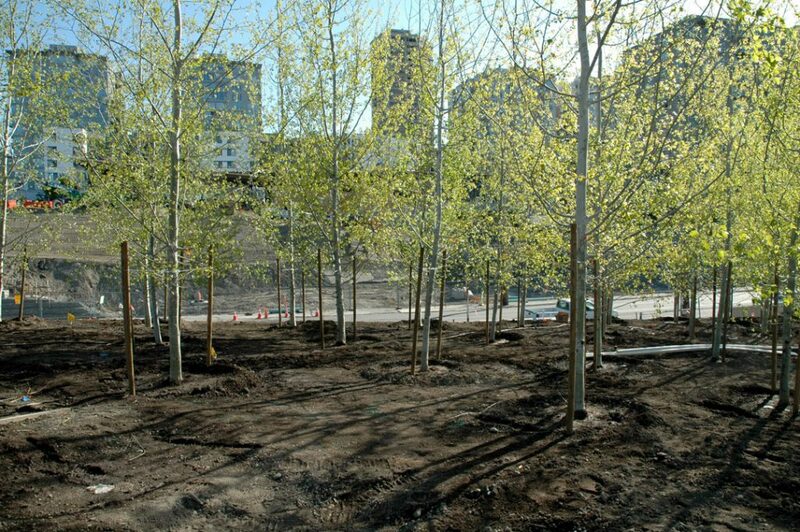 Bagley’s normal practice is to create her work alone indoors, but for this experience she really enjoyed creating work on-site at the Olympic Sculpture Park, being outdoors and working with so many visitors. This was the first time she did this type of collaboration with a group of strangers, and she found that the experience offered a very different type of inspiration. 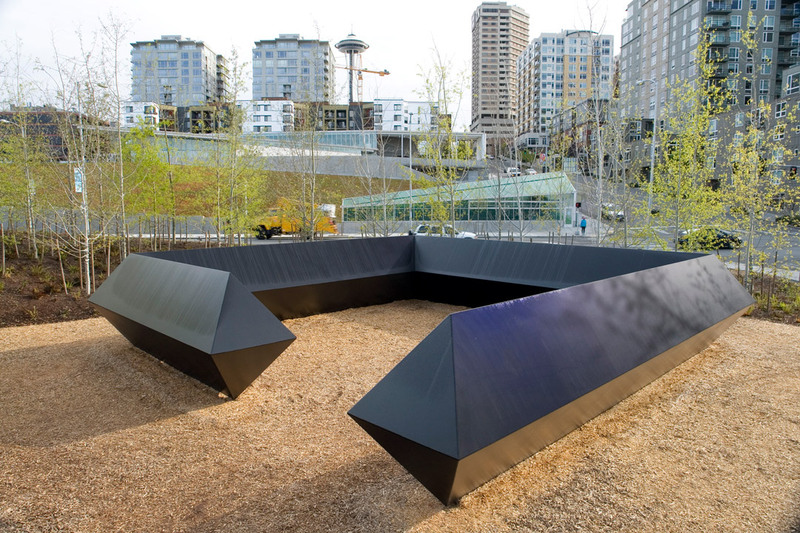 The Seattle Art Museum is celebrating the Olympic Sculpture Park’s 10th anniversary this year. In addition to considering how the park has changed since its opening, it’s also rewarding to reflect on the many thoughtful, creative projects like this that have been inspired by it. 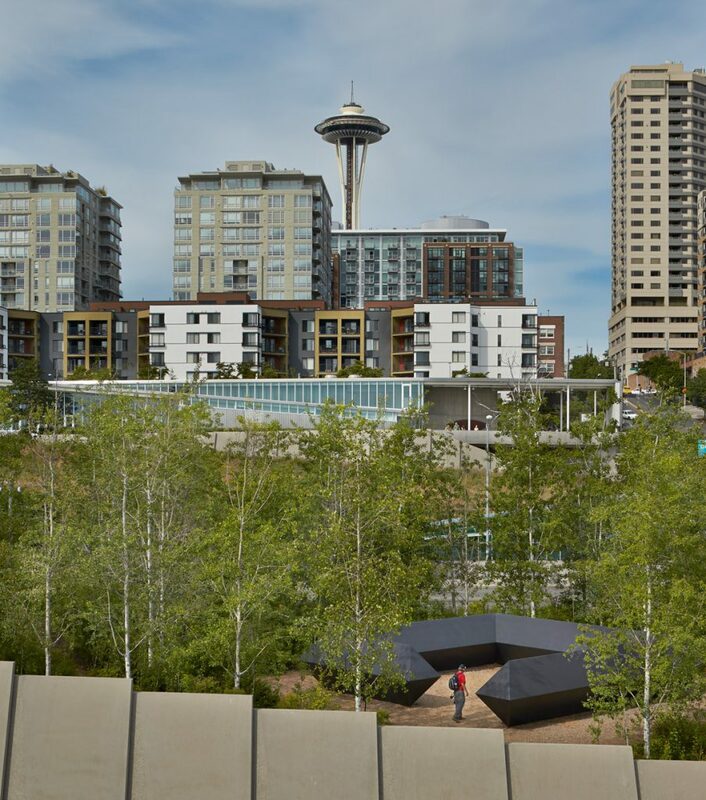 The Trust for Public Land Terrace resides at one of the Olympic Sculpture Park’s most active intersections. 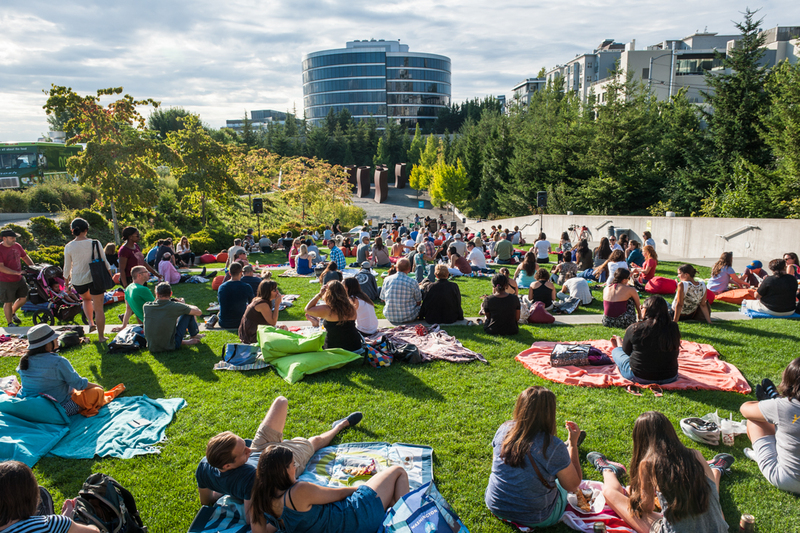 The Terrace is one of the best places to watch people gathered to picnic, sketch, and listen to live music on the grassy tiers of the Gates Amphitheater that cascade down to the valley. Richard Serra’s massive sculpture, Wake, looks especially striking with the surrounding landscape seen from the Terrace surrounding the PACCAR Pavilion. The contrast of the green firs, cedars, and hemlocks in the surrounding valley highlight the industrial steel sculpture’s organic color and forms. 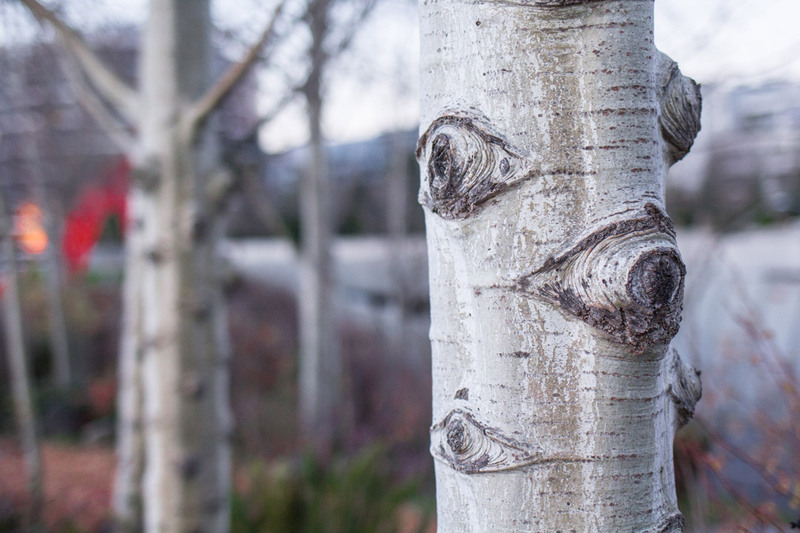 The Trust for Public Land’s role as SAM’s partner in the creation of the Olympic Sculpture Park is embodied in the intersection between art, nature, and community that can be seen from the Terrace. 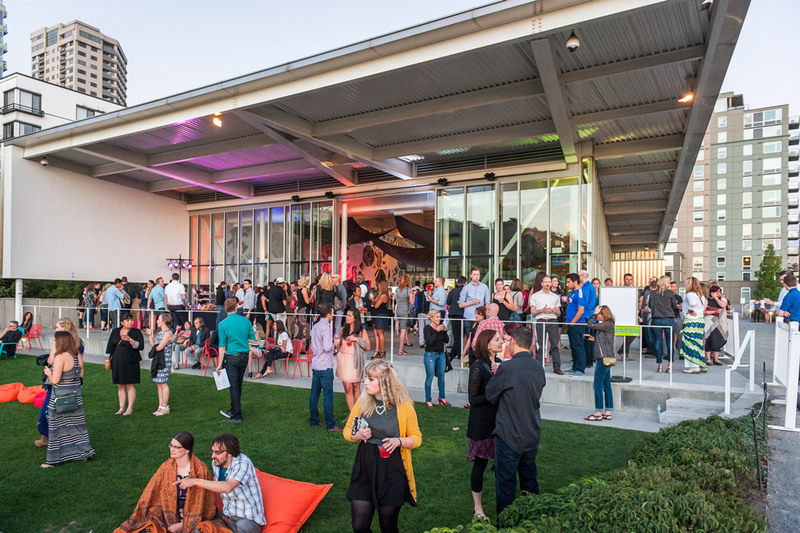 The two organizations worked together to purchase and clean up the former Unocal (Union Oil of California) brownfield site that became the Sculpture Park. In turn, the park speaks to a number of environmental goals relevant to The Trust for Public Land’s mission. 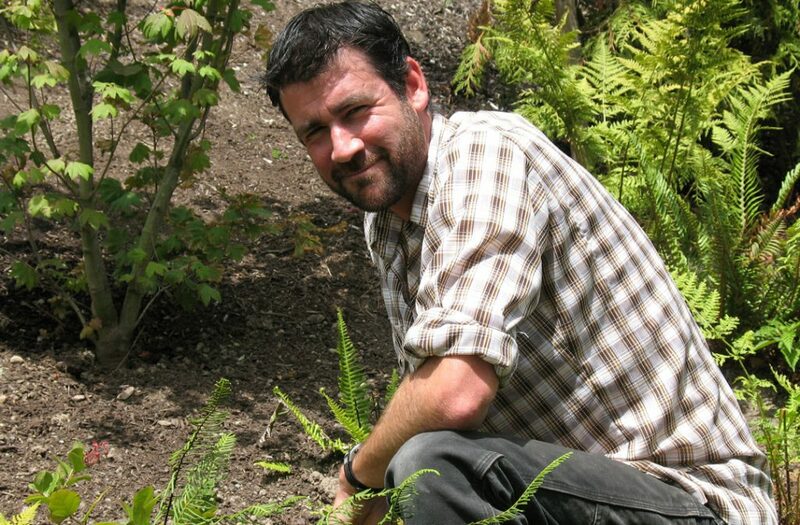 Shaun O’Rourke, the national organization’s Green Infrastructure Director, explained, “Increased urban green space is at the core of our mission to create healthy livable communities for generations to come . . . Cities need to think about how they can solve multiple problems at one time, and parks offer unique solutions for climate adaptation.” He went on to describe how the Olympic Sculpture Park addresses many of The Trust for Public Land’s Climate-Smart Cities program objectives by cleaning up and converting a former industrial site into one that has a more resilient coastline edge, connecting the city directly to the water, and reducing the heat island effect by introducing high-reflectivity pavement to the site. 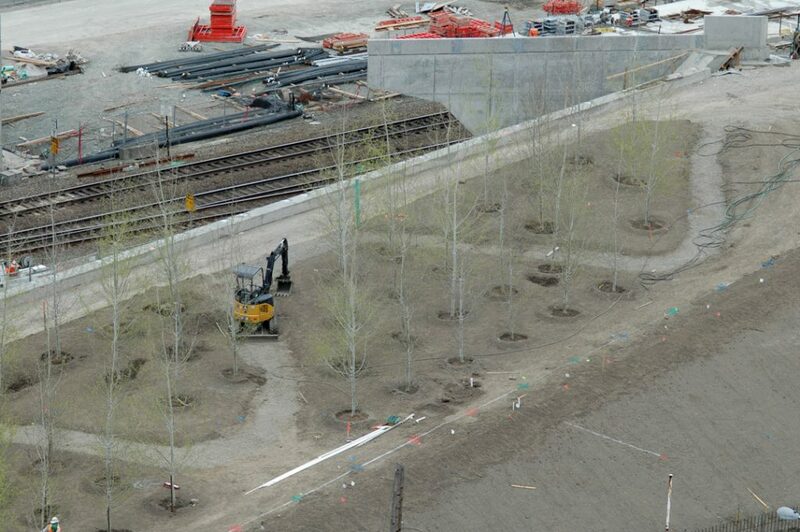 When considering the environmental achievements of the park, Julie Parrett, a former project manager for the Charles Anderson Landscape Architecture firm that contributed to the park’s design, pointed to its storm water collection and drainage system. She explained, “Any precipitation that falls on the park’s eight and a half acres outflows directly into Elliott Bay, as opposed to being taken all the way over to a treatment center near Discovery Park.” This is possible because the Sculpture Park is filled with native plantings that don’t require the use of pesticides, herbicides, or insecticides that would contaminate the storm water—an important innovation 10 years ago that has since become more common in parks throughout the country. The Trust for Public Land Terrace offers the vantage point it does because it sits atop one of the highest points of the park’s varied topography. As Parrett explained, many of the hills and valleys resulted from the addition of clean fill to the site. In this case, the fill was brought from the SAM’s building excavation downtown, whose expansion was being constructed at the same time. 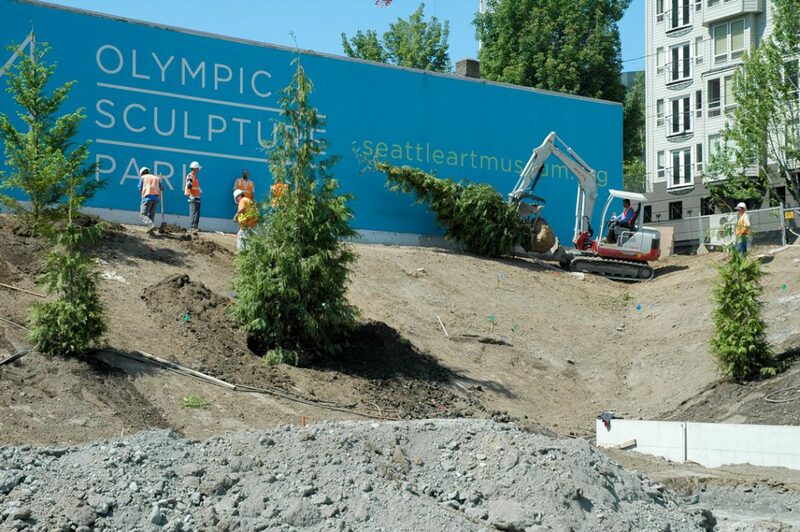 Instead of trucking in new fill from elsewhere, the Olympic Sculpture Park reused the excavation debris as landscape features. 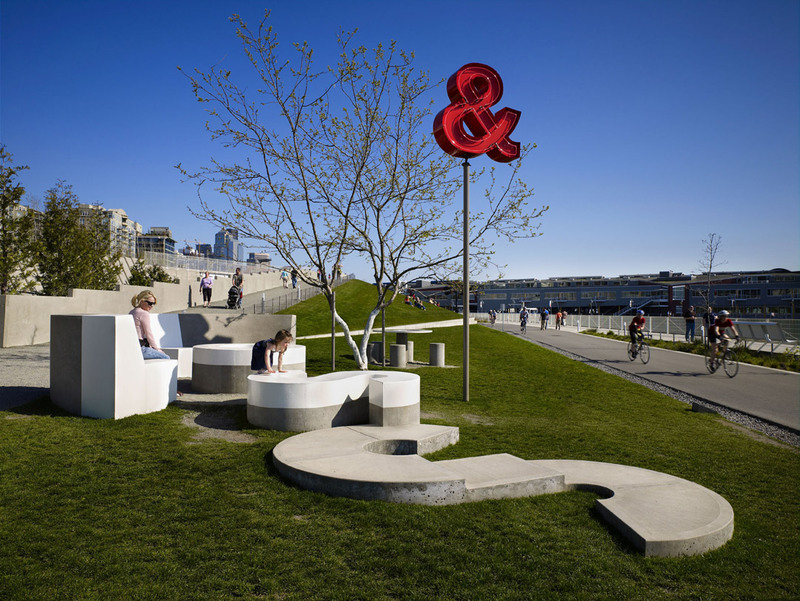 This post is part of an ongoing series exploring the history of the Olympic Sculpture Park in celebration of its 10th anniversary. Over the course of this year, we will continue reflecting on the Park’s evolution over the past decade. Images: Photo: Robert Wade. Photo: Robert Wade. Photo: Robert Wade. Photo: Nathaniel Wilson.